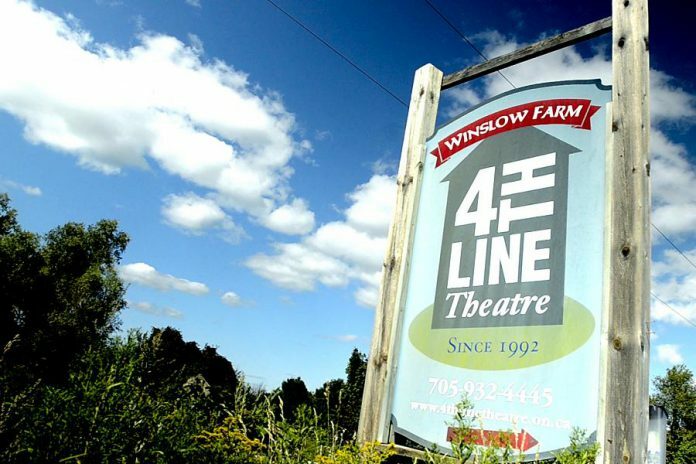 Item #2 on our ultimate Peterborough & the Kawarthas summer bucket list: epic plays from 4th Line Theatre performed outdoors among the rolling hills of Millbrook at the picturesque Winslow Farm. Read on for 10 more unique summer experiences available to residents and visitors alike in Peterborough & the Kawarthas. Whether you’re looking for a new adventure, planning a staycation for your family, or simply want to get out and enjoy nature, there’s something for you all summer long in Peterborough & the Kawarthas. 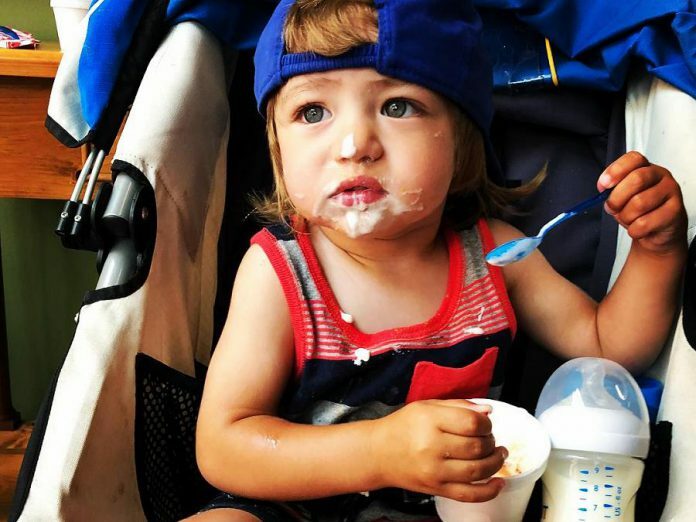 Here are 11 must-try things to add to your summer bucket list in Peterborough & the Kawarthas for the rest of July. 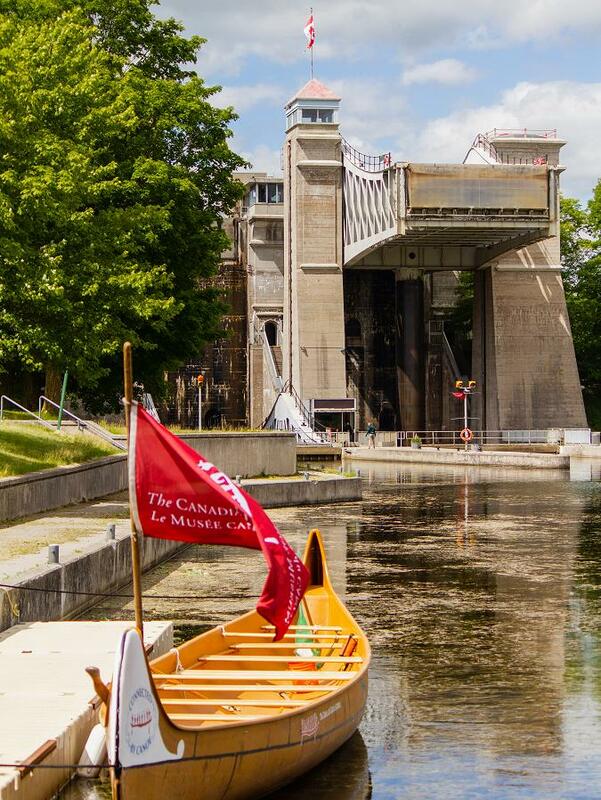 You can climb on board The Canadian Canoe Museum’s Montreal canoe and paddle it through the Peterborough Lift Lock. No visit to Peterborough & the Kawarthas is complete without experiencing the famed Peterborough Lift Lock — the world’s highest hydraulic lift lock! This National Historic Site of Canada is an engineering marvel, lifting boats almost 20 metres (65 feet) above the Trent Canal in two bathtub-like chambers. The majestic lock first opened in 1904 after eight years of construction, and continues to operate, allowing boats to travel along the Trent-Severn Waterway every summer. You can drop in to the Peterborough Lift Lock Visitor Centre (353 Hunter Street East, Peterborough) to learn all about the history of the Peterborough Lift Lock, but the real fun comes from going through the Lift Lock itself. Liftlock & The Riverboat Cruises offers two-hour sightseeing cruises three times daily that go through the Lift Lock. And, if you want to experience the Lift Lock up close and personal, how about paddling a 36-foot Montreal canoe into the Lift Lock? The Canadian Canoe Museum offers Voyageur Canoe Tours throughout the summer. This tour is designed for people of all ages and abilities, and no previous paddling experience is necessary (custom tours for groups are also available). 4th Line Theatre in Millbrook is renowned for its epic summer theatrical experiences — each presented outdoors at the picturesque Winslow Farm in Millbrook. Founded in 1992 by Creative Director Robert Winslow, 4th Line Theatre is committed to preserving Canada’s cultural heritage by writing and staging entertaining plays rooted in regional history. You haven’t seen theatre until you’ve watched the highly skilled 4th Line Theatre company perform on the barnyard stages of Winslow Farm in the rolling hills of Millbrook, as swallows swoop through the buildings. It’s an experience you won’t soon forget. This season, 4th Line Theatre is presenting “Crow Hill: The Telephone Play”, a largely humorous story based on one of the first independent telephone services in rural Ontario, followed by “Who Killed Snow White?”, a more serious and challenging play about the impact of cyberbullying on a teenage girl. “Crow Hill: The Telephone Play” runs until July 28th, and “Who Killed Snow White?” runs from August 6th to 25th. 4th Line Theatre is located at 779 Zion Line in Millbrook. For more information, including how to get tickets, visit www.4thlinetheatre.on.ca. Once you taste Kawartha Dairy Ice Cream, available in 33 flavours from Stuff’d Ice Cream Bakery & Cafe in Lakefield, you become a lifelong fan. Stuff’d Ice Cream Bakery & Cafe (18 Bridge Street, Lakefield) is a family-run business where you can satisfy your sweet tooth, from home-made apple fritters and Cornish pasties to deliciously smooth Italian coffees. Did we mention they carry 33 flavours of Kawartha Dairy Ice Cream? We may be biased, but the Bobcaygeon-based dairy produces the best-tasting ice cream in the world. Stuff’d is located at the former location of the iconic Hamblin’s Restaurant & Pizza & Ice Cream Parlour, and is now owned and operated by Gill and Nick Exton. While you’re there, drop into the Exton’s other businesses: the popular Canoe & Paddle, an English-style pub located right next door, and The Stuff Store, an interesting and fun gift store located at 48 Queen Street. For more information on Stuff’d Ice Cream Bakery & Cafe, visit www.facebook.com/Stuffdlakefield/. The 41st annual Buckhorn Fine Art Festival is a world-class art festival showcasing more than 80 Canadian visual artists, sculptors, jewelers, and photographers. The family-friendly festival, which also features activities for kids, live music, and more, runs from August 17 to 19, 2018 at Festival Park at Buckhorn Community Centre. Whether you’re art enthusiast or a serious collector, you have two reasons to make a trip to Buckhorn this summer. Whether you’re a resident or a visitor experiencing the region for the first time, Peterborough & the Kawarthas Tourism can help you plan your summer of fun. You can visit them virtually at thekawarthas.ca or in person. The Peterborough & the Kawarthas Visitor Centre is centrally located in the heart of the City of Peterborough, Ontario, Canada at 270 George Street North, Suite 101. Open year round, the Visitor Centre provides a wide selection of free information including travel guides, brochures, roadmaps, and trail guides. Trained travel counsellors are available to assist in making your visit to Peterborough & the Kawarthas an exceptional experience. Drop by or contact them today to start planning your visit to Peterborough & the Kawarthas. You can also follow Peterborough & the Kawarthas Tourism on Facebook, Twitter, and Instagram. Did you know one of Canada’s largest privately owned retail art galleries is located on the shores of beautiful Buckhorn Lake? The Gallery on the Lake (65 Gallery on the Lake Rd, Buckhorn) features 15,000 square feet of original fine art, sculpture, glassware, pottery, and jewelry from Canada’s leading and emerging artists. Open daily from 10 a.m. to 5 p.m., the gallery also runs regular artist exhibits. “Northern Soul”, a collection of new works by Canadian artist Mark Berens is on now until July 27th, followed by an exhibition of work by David Grieve, Peter Rotter, Joe Sampson from July 28th until August 31st. For more information, visit www.galleryonthelake.com. 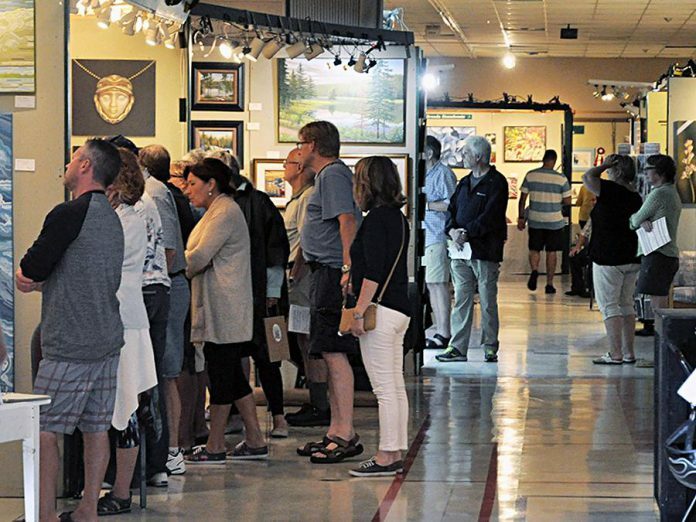 And, this August, the 41st annual Buckhorn Fine Art Festival takes place at Festival Park at Buckhorn Community Centre (1782 Lakehurst Road, Buckhorn). This world-class art festival features works by more than 80 Canadian visual artists, sculptors, jewelers, and photographers. Held from Friday, August 17th through Sunday, August 19th, the festival also features live music, food and refreshments, an “ARTivity Zone” for the kids, an art competition, and a special exhibit called “The Lives of Birds”. There’ll also be a draw for an original work by famed wildlife artist Michael Dumas on opening night. The Buckhorn Fine Art Festival is a fundraiser for the not-for-profit Buckhorn Community Centre. For more information, visit www.buckhornfineart.com. 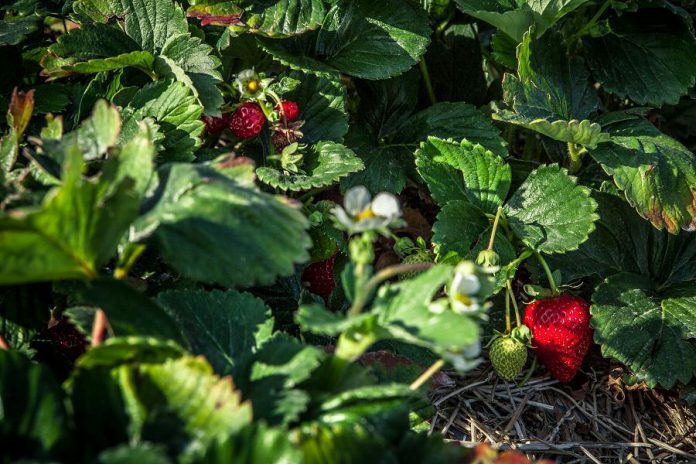 McLean and Buckhorn Berry Farms in Lakefield offers both pick-your-own and pre-picked berries in season, as well as a variety of other produce. Summer isn’t complete if you haven’t popped a juicy berry into your mouth, picked fresh from the vine! McLean Berry Farm is one of the most popular berry farms in Peterborough & the Kawarthas. Located at 2191 16th Line (with its sister farm, Buckhorn Berry Farm, located at 3055 Berrie Road), McLean’s is famous for its strawberries. While strawberry season has drawn to an end, pick-your-own raspberries are now available. But it’s not just berries: McLean and Buckhorn Berry Farms also offers pick-your-own black currants, pod peas, and sugar snap peas, and other fresh vegetables such as beans and sweet corn, both grown on-site and from other local and Ontario farms. If you can’t make it to either farm, you can also visit the McLean and Buckhorn Berry Farms stalls at farmers’ markets in Peterborough & the Kawarthas, including the Peterborough Downtown Farmers’ Market on Wednesday, the new Peterborough Saturday market in downtown Peterborough, and the Lakefield Farmers’ Market. There are 22 public beaches in Peterborough & the Kawarthas, and one of the most popular is Sandy Beach in Trent Lakes near Buckhorn. Located at A. Shearer Park (1221 Lakehurst Road, also known as County Road 37), Sandy Beach gets its name for the soft sand that extends from the shoreline into the warm shallow water — making it perfect for families with young children. Sandy Lake also features the kind of clear and beautiful turquoise water normally associated with tropical beaches (the turquoise colour comes from the minerals present in the spring-fed water that feeds the lake). The beach is surrounded by grassy parkland and has a barrier free walkway, a designated handicapped parking area, and a load and unload zone for families or paddlers. Sandy Beach is a lovely drive from Peterborough — either via Buckhorn or through Ennismore and across Gannon Narrows. Or make this day trip complete by doing the full loop! In the past few years, Peterborough & the Kawarthas has become the location of choice for many award-winning microbreweries. There are more than a dozen in the area, making it a must-visit destination for anyone who enjoys a fine-crafted brew. Last year, Peterborough & the Kawarthas joined the Brewery Discovery Routes with the launch of the self-guided “Beers, Bites & Barns” tour. This route includes local craft breweries, wineries and distilleries, as well as restaurants and natural assets. Check out the hand-picked itinerary at www.thekawarthas.ca/brew to help you explore tasty craft beverages and fresh local food. Smithavens Brewing Company (687 Rye St., Peterborough) is a family-owned and operated craft brewery specializing in traditional European beers, brewed in small batches to ensure maximum freshness and taste. Stop by the brewery and enjoy a glass in a beautiful and comfortable tasting room overlooking the brewery. Bottles and kegs can be purchased from the retail store, and educational tours are available. The Publican House Brewery (300 Charlotte St., Peterborough) is another family-owned brewery, located in the heart of downtown Peterborough. All beer — including the popular Pub House Ale and Square Nail Pale Ale — is brewed on site and is available at the retail store (cans, growlers, and kegs) as well as at select LCBO, The Beer Store, grocery stores and more. Last year, Publican House opened a Brew Pub in the historical building that inspired the brewery, offering a full menu and — of course — a selection of house and guest beers. Beardfree Brewing (649 Unit 4 The Parkway, Peterborough) is Peterborough’s latest craft brewery. A partnership between head brewer Nyckolas “Nick” Dubé, John Rozema, and Steveon Zablosky, the microbrewery produces four core beers named after Peterborough landmarks — “Simcoe St”, their signature dry hopped India Pale Ale (IPA); “Harstone”, a malty Irish Red Ale; “Lock 21”, a classic cream ale; and “Little Lake”, a French Saison — along with two or three seasonal, limited-release brews. Bottles are available from the brewery’s storefront, which also features a small taproom. If you want to taste craft beer truly brewed in the heart of cottage county, make the trip to Belmont Lake Brewery (54 Fire Route 17, Havelock). Located on the shores of beautiful Belmont Lake, the small craft brewery is the only one you can visit by boat as well as by car! Opened in 2016 by British expatriates Julie and Norrie Bearcroft, Belmont Lake Brewery specializes in brewing English beers with a Canadian twist. The Bearcrofts usually have four and five of their brews on tap at any one time. For more information about these breweries and more, visit www.thekawarthas.ca/brew. The Havelock Farmer & Artisan Market is new this summer, and offers produce, artwork, crafts and much more. One of the joys of a summer road trip in Peterborough & the Kawarthas is stopping at the side of the road to stock up on fresh local produce — and maybe a unique handcrafted gift or two. This summer, make sure to drop by the Havelock Farmer & Artisan Market — one of the newest farmers’ markets in Peterborough & the Kawarthas, having just launched this past June. The market, which runs every Friday from 2 to 8 p.m. until Thanksgiving, is located on the south side of Highway 7 in Havelock (across the street from the Havelock Home Hardware). 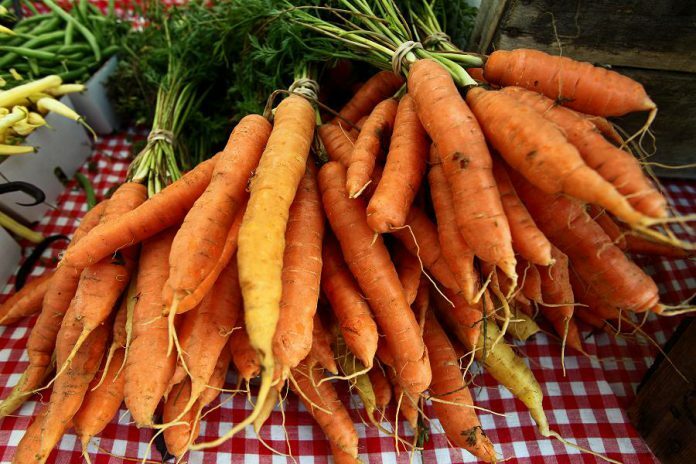 Organized by a group of Havelock residents including local farmers and producers, the market features around 20 vendors selling produce, honey, jewelry, flowers, artwork, cider, range-fed poultry, handmade soap, wooden ware, crafts, and more. All vendors must come from within 100 kilometres of Havelock. For more information, visit the Havelock Farmer & Artisan Market Facebook page at www.facebook.com/HavelockMarket/. If your idea of a perfect summer day includes lounging outside while listening to live music, Peterborough & the Kawarthas has you covered all summer long — and much of the music is free! First up is Peterborough Musicfest, the free summer concert series that takes place at Del Crary Park in downtown Peterborough every Wednesday and Saturday night at 8 p.m. until August 25th. The line-up for the rest of the season includes Wintersleep (July 21), Scott Helman (July 25), The Reklaws & Tebey (July 28), JJ and The Pillars & Dwayne Gretzky (August 1), The Funk Frequency (August 4), Alan Doyle (August 8), Against The Wind (August 11), Terri Clark (August 15), The Legends Tribute (August 18), Bobby Bazini (August 22), and Classic Albums Live: CCR Chronicle Vol 3. (August 25). Bring your own lawn chairs or blankets (lawn chairs are available to rent). Then there’s the annual Hootenanny on Hunter Street, which takes place on Saturday, August 11th in downtown Peterborough. The free street music festival runs from noon until 11 p.m. and features Missy Knott, Charmie, Gene Hardy & Sparkjiver, Lindsay Barr, Band Of People, Blue Sky Miners, Secret Broadcast, YUKA, and headliners Sloan. Just show up and enjoy an afternoon and evening of live tunes! From Friday, August 17th to Sunday, August 19th, the 29th annual Peterborough Folk Festival returns to Nicholls Oval Park. Other than the ticketed kick-off concert on Friday featuring Terra Lightfoot at the Market Hall in downtown Peterborough, the festival is free. Performers on Saturday include Bedouin Soundclash and The Spades, with Basia Bulat and Splash N’ Boots appearing on Sunday, and more acts to be announced soon. The festival also offers more than 40 artisan and craft vendors, as well as kids’ performers and activities all weekend long. If country music is more your thing, you won’t want to miss the Havelock Country Jamboree, Canada’s largest live country music and camping festival. The 29th annual festival takes place from Thursday, August 16th to Sunday, August 19th and features more than 25 musical acts on its twin stages. This year’s line-up includes Toby Keith, Dean Brody, Tim Hicks, Tanya Tucker, Doc Walker, The Good Brothers, Doc Yates, and more. This one isn’t free though; more information about the festival and ticket prices is available at havelockjamboree.com. 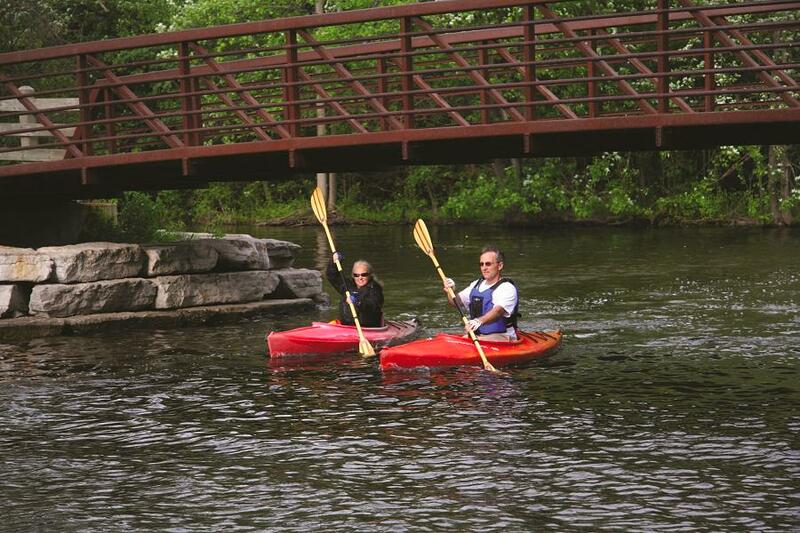 The City of Peterborough has both the Otonabee River and Little Lake at its heart, with the latter connecting to the Trent-Severn Waterway, offering endless opportunities for getting out on the water. If you love water sports and you don’t have a cottage (or a friend with a cottage), all is not lost — you can still enjoy a day on the water right in the heart of Peterborough. Pedal ‘n’ Paddle (130 King St., Peterborough) offers kayak, canoe and paddle boat rentals so you can head out on Little Lake and the Otonabee River (bicycles are available for rent if you prefer to stay dry). They also offer “River Run Adventures” along the Trent-Severn Waterway from Trent University or at the Squirrel Creek Conservation Area. Pedal ‘n’ Paddle is open from Tuesdays to Sundays in July and August. For more information including rates, visit peterboroughpedalnpaddle.com. Stand-up paddling (SUP) is one of the fastest-growing water sports. If you want to give it a try, Peterborough SUP (247 George St. N, Peterborough) rents stand-up paddleboards (SUP) on Little Lake and provides professional on-water paddleboard instruction, including beginners’ group lessons and private lessons. They also offer SUP Yoga classes and sell paddleboards. For more information, visit www.peterboroughsup.ca. Winding rural roads, rolling hills, and scenic lake vistas have long made the region a favourite destination for cyclists, whether for serious road training or for a casual ride with family and friends. If you enjoy cycling, you’ll definitely want to try one or more of the Peterborough & the Kawarthas Classics Road Cycling Routes — three picturesque and challenging or not-so-challenging bicycle routes ranging in distance from 45 to 100 kilometres that begin and end in the City of Peterborough at Millennium Park overlooking Little Lake. To help you stay on track, more than 160 cycling route signs have been installed throughout the City and County of Peterborough. For a description of each route, along with PDF versions of Maps and links to route maps via Map My Ride and Strava, visit thekawarthas.ca/peterborough-the-kawarthas-classics-road-cycling-routes/. Stay tuned for more items for your Peterborough & the Kawarthas summer bucket list in August and September! All photos and videos are courtesy of Peterborough & the Kawarthas Tourism except where noted.